Flash Duration as Low as 1/3,000 Sec. The Elinchrom Ranger Quadra Hybrid RX Lead-Gel Battery 1-Light Standard S Kit who requires lightweight, super-fast performance and independence from a direct electrical source. 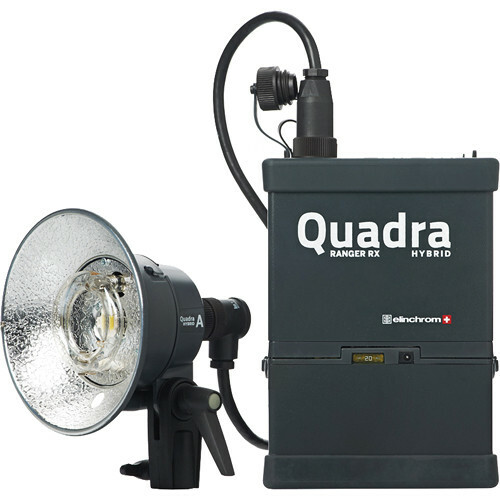 The kit includes a Ranger Quadra Hybrid RX Pack with a Lead-Gel Battery, multi-voltage charger and a small, very lightweight RQ Hybrid (Standard) S flash head. The Elinchrom Ranger Quadra Hybrid RX Pack delivers an impressive 400W/s of power in a small package that weighs in at only 6.6 lb. Besides power it offers speed and can recycle in 0.41 to 2.26 seconds at 115V at flash durations as short as 1/3,000 sec. with the included RQ Hybrid Standard (S) head. The head comes with a 70 degree umbrella reflector and an LED modeling light that produces the tungsten equivalent of 40W while only drawing 20W. But what's power without control? The Quadra Hybrid has a 6.6 stop power range that's variable in 1/10 stops and can distribute power symmetrically or asymmetrically. It also has a built-in EL-Skyport Receiver with 8 frequency channels that can handle 4 distinct groups of flashes. Purchase of the optional EL-Skyport Speed Transmitter not only allows you to trigger your pack at distances up to 393' but gives you control of power, on/off, modeling light functions and Speed Sync activation. Free software for Mac and PC computers is available when you buy the transmitter, adding additional features such as Flash-Delay for strobing effects. Add an optional USB Wi-Fi module for computer control and software that allows you to use specially designed apps that offer full remote control via your for iPhone, iPad or iPod Touch. Box Dimensions (LxWxH) 16.0 x 8.0 x 8.0"